BALA — Finding cranberries may be a little easier at this year’s Cranberry Festival here. 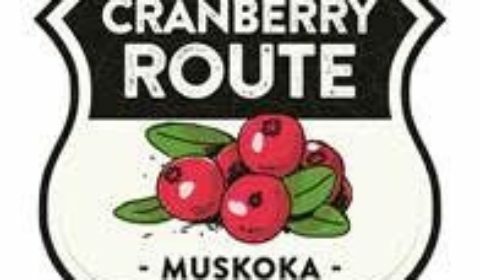 Register by this Friday Sept. 14 to become part of the new Muskoka Cranberry Route. A number of partners are coming together to create a year-round tourism attraction, the Muskoka Cranberry Route, centred around Muskoka’s beloved fruit. They are encouraging restaurants, bakeries, breweries, retail stores and accommodations to sign up and become a stop on the route. It will help customers see where the tasty little “Reds” are sold. Accommodations: be one of our suggested overnight stays for visitors who are taking the Muskoka Cranberry Route. Sign up to be on the route! Sign up by this Friday, Sept. 14. The cost is $100 to $150 for restaurants, depending on the number of cranberry experiences they offer: for example if you sell cranberry wine and a salad with cranberries it’s cheaper. If a retail store sells cranberries they can be a friend for $25. Eligibility: Participating businesses must have a bricks and mortar storefront in Muskoka with a Cranberry product/experience. The cranberries you use must originate from Canada. Retail stores who sell a cranberry product can be featured on the website as a friend of the route at a reduced cost. This is a partnership of the Muskoka Lakes Chamber of Commerce, Muskoka Lakes Township, Bala Cranberry Festival and Muskoka Tourism.